Do you love classic rock guitars? 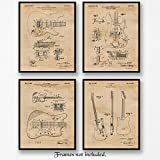 This Vintage Patent Print 1955 Classic Rock Guitar tee is a cool gift for any guitarist, musician or song writer. 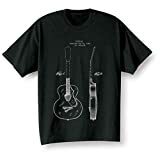 Grab this classic rock guitar print t shirt for a guitar player or any fan who loves music from the 60s, 70s or 80s as well as classic rock. Do you love classic rock guitars? 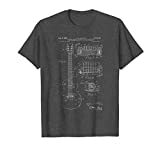 This Vintage Patent Print 1955 Classic Rock Guitar tee is a cool gift for any guitarist, musician or song writer. 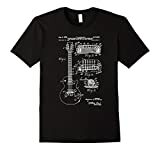 Grab this classic rock guitar print t shirt for a guitar player or any fan who loves music from the 60s, 70s or 80s as well as classic rock. Among the fascinating holding in government archives are the intricate drawings patent seekers must file. Four delicate images from decades past are printed on black 100% cotton tees. Sizes S-3XL. Imported. ORIGINAL PATENT APPLICATION NUMBER 909,900 FOR A RECORDING SYSTEM (LOS ANGELES).